There are no notes and no calculators allowed at any exams. Midterm 1 is scheduled for Friday, Sept. 21. * I handed out a sample sample exam in class on Friday, 9-14. That sample exam, and the scanned solutions are on BbLearn. * Tess Siemens will have a review session after class on Thursday, 12:30-1:30 in our classroom. * The PMAs Amber an Megan wil have a review session Wednesday, 6:00-8:00pm in the MAP room (AMB 137). * You can rework old webwork problems. I suggest you go to "User Settings" and set "Show saved answers?" to No. * There is a review sheet on BbLearn. Bring your NAU ID card or some other straight-edge. This will be used to draw tangent lines on the exam. Exam 1 will cover WeBWorK sets 1 through 8. It will cover up through the first 2 examples of section 3.2 in the book. If the book has a topic that we did not cover in class and did not cover in the webwork, it will not be on the test. derivative of f(x) = x2 + 3x -2. (Shortcuts are not allowed.)" If you write down only "f '(x) = 2x + 3" you get absolutely no points. In fact, I may even give you the derivative, like in the sample exam. I may take points off if you use bad "grammar" even if you get the correct answer. This is especially true of the problems that ask to evaluate limits. Write "lim" where it belongs, and don't write it where it does not belong. Midterm 2 is scheduled for Wednesday, October 17. There will be review sessions on Monday and Tuesday evenings, 6:00 to 8:00, in the MAP room (AMB 137). Here are some review sessions from other Peer TAs. You can go to any of these. No calculators, and no notes, are allowed at this exam. You may not have a cell phone or smart watch during the exam. They must be placed in your backpack. All backpacks need to be at the front or back of the room. The exam will mainly test your ability to differentiate using shortcuts. It will cover WeBWorK sets 9 - 14. One of the best ways to study for the exam is to re-do all of the webwork problems (with your old answers hidden). 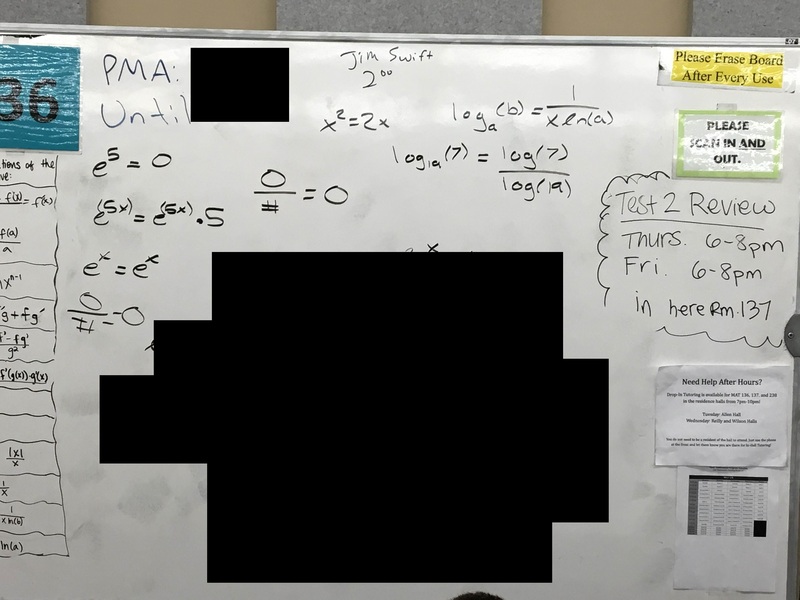 You will be tested on your knowledge of the "rules" including the constant multiple rule, sum and difference rules, product rule, quotient rule, and chain rule. You need to know the derivatives of mx + b, xa, ex, ax, sin(x), cos(x), tan(x), arcsin(x), arctan(x), ln(x), and ln|x|. See the handout entitled Differentiation Shortcuts for everything you need to know. You may need to evaluate functions like sin(7 π/6) or arcsin(1/2), tan(π/6) or ln(e2) without your calculator. You may have to give an equation of the tangent line to a given curve at a given point. You may have to sketch the graph y = f '(x) given the graph y = f(x). d/dx sin(x2 + 3x) = cos(x2+3x)*(2x + 3). The answer cos(x2+3x)*2x + 3, without the parentheses, is wrong. d/dx ecos(x) = ecos(x)*(-sin(x)) = -sin(x) ecos(x). The answer ecos(x) -sin(x) is wrong. You may also loose points if you write "x2 = 2 x", or the equivalent. Midterm 3 is scheduled for Friday, November 9. No notes, calculators, phones, watches, or any electonic devices are allowed. A sample exam was handed out in class on Thurdsday, and the pdf is on BbLearn. The scanned solutions will appear soon. There will be many review sessions as listed here.. In particular, Tess will have a review session on Thursday after class. Look for errors of this sort on the MAP room white board from a past semester!